The score, the phone home jokes, ah yes who can forget the impact Steven Spielberg's classic sci-fi drama E.T. The Extra-Terrestrial had on the world when it was released thirty years ago. And to celebrate, this 12th November, Universal Pictures UK are bringing an all-new, digitally remastered picture and 7.1 surround sound release to Blu-ray and DVD. Available in both normal and Steelbook versions, also included is an UltraViolet and digital copy of the film, so you can watch it on the device of your choosing, within reason. When an imaginative boy meets a lost alien, it is the beginning of one of cinema's most endearing friendships, as Elliot (Henry Thomas) helps the marvellous creature he calls E.T. find his way back home before government agents can capture him. In 1982, E.T. The Extra-Terrestrial became the biggest blockbuster of the year, debuting at No 1. around the world. Nominated for nine Academy Awards® including Best Picture, Best Director, Best Cinematography, Best Writing and Best Screenplay, the film took home four statuettes for Best Visual Effects, Best Sound Effects Editing, Best Sound and Best Music for John Williams' (Jaws) memorable score. "When E.T. The Extra-Terrestrial premiered in 1982, it captured the imaginations of people young, old and everyone in between in a way that was unparalleled in modern movie history," said Craig Kornblau, President of Universal Studios Home Entertainment. 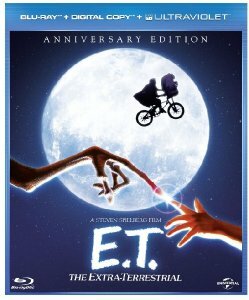 "A global cultural phenomenon - and the biggest box-office blockbuster of its day - E.T. brought out the child in all of us. We are thrilled audiences will now be able to experience the film in the astounding quality of Blu-rayTM."